As much as 77% of the U.S. adult population say they experience the physical symptoms of stress on a regular basis. But, despite this, not everyone is aware that their physical ailments may be caused by the condition. When we feel anxious, nervous, or tense, it’s easier to recognize the pressures we’re under. Stress can also manifest itself in physical conditions, impacting on our health at large. When this happens, it can be more difficult to identify it as the root of the problem. Recognizing the physical symptoms of stress can enable us to identify when we need to take a break or implement measures to reduce and manage the stress in our lives. The busy nature of modern life makes it easy for stress to become the norm, which may make us less aware of it when it’s affecting us. Juggling families and jobs; regularly traveling for work; working long days; and worrying about bills and household expenses can all take their toll without us realizing. While not all of the effects of prolonged stress are visible, there are some signs we can watch out for in our physical health, particularly when we’re affected by more than one of them. An increased frequency or intensity of headaches is one of our body’s early warning signs that it may be time to take a break. 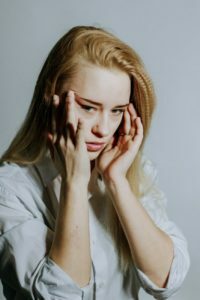 Stress-induced headaches may be caused by the release of chemicals into the brain as a result of emotional stress, or they may come from insufficient sleep that is also associated with stress. When we’re under intense pressure, it may be harder for us to fall or stay asleep, and many people find that they do not allow themselves enough sleep or adequate time to relax when their regular schedule is busy. Stress can also affect the digestive system, sometimes triggering stomach aches and nausea. Muscle tension is often another sign of stress, leading to aches and pains, stiffness, and sometimes, shortness of breath caused by tension in the muscles associated with breathing. Fluctuating hormones can cause an irregular menstrual cycle in women, and in some cases, periods may stop altogether. Our skin is also a place to look out for stress. Stress can trigger or exacerbate conditions like eczema and psoriasis. Even for those who do not experience these conditions, stress may be the cause of unexplained rashes or itching. Finally, an increase in viral infections, like colds, can signify a weakened immune system, which is another common effect of stress. In addition to these warning signs, stress can impact our physical health in less visible ways. In times of intense stress, the liver can release glucose into the bloodstream, causing blood sugar to rise; if this situation is prolonged, this can leave us at risk of type 2 diabetes. Blood pressure may become elevated due to the tightening of blood vessels caused by stress hormones, and over time, this can cause pressure on the arteries, putting us at a higher risk of a heart attack. Even for women who don’t notice a disruption to their menstrual cycle, stress can also affect fertility, making it harder to conceive, and men’s fertility can also be affected. Using the recognizable physical symptoms of stress as a signpost to tell us there’s a problem we need to address can prevent the long-term physical consequences. Implementing stress management techniques; ensuring regular exercise and sufficient sleep; taking time out to relax; and eating a healthy, balanced diet are all valuable ways in which we can combat stress, and in doing so, solve the physical problems that have presented themselves as a result. The use of medical aids, nutritional supplements and exercises that target tense muscles will help alleviate the associated physical conditions, but it’s also important to look at the root of the problem, and take steps to reduce exposure to everyday stress. Stress is an inevitable part of human life, but it can have real consequences on our health if it is left unaddressed. Recognizing the physical problems it can trigger is an important skill to master if we are to reduce its impact on our long-term health. This entry was posted in At-Home Medical Care Products and tagged health, medical aids, stress. Bookmark the permalink.